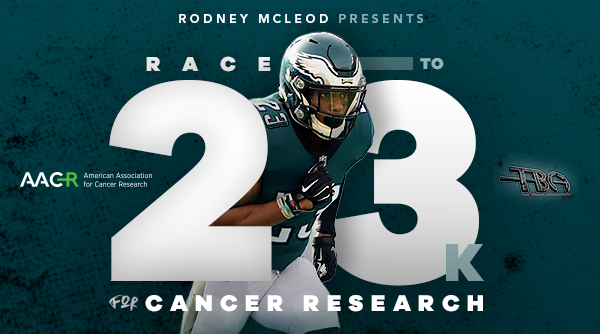 As an ambassador for the American Association for Cancer Research (AACR) Foundation, Philadelphia Eagles safety Rodney McLeod has announced “Race to $23K for Cancer Research,” a fundraiser to support lifesaving cancer research at the AACR. For every interception, forced fumble, sack, or tackle for a loss this season, McLeod will donate $1,000 to the AACR Foundation in support of pancreatic cancer research, with the goal of raising $23,000. McLeod is encouraging his fans to join him in the fight against cancer through several initiatives he is spearheading. For more information and to participate in the Race to 23k for Cancer Research visit the official AACR website.